Wow, this book was good! I started Broken thinking it was going to go in a predictable direction, and Lyons blew my expectations out of the water. Broken is contemporary YA, but it's also a thriller, and a great one at that! My heart was racing for the last 45 minutes or so of the story....not such a good idea for reading right before bed, because I was very revved up by the time I finished reading (and of course I had to finish before I could go to sleep!). Scarlet has been sick for her whole life. As a fellow "sick kid," I really identified with her. I don't have a heart condition, but my illness does require me to stay home much of the time, like Scarlet. Scarlet wants nothing more than a normal high school experience, and she finally convinces her parents to let her attend high school for a week on a trial basis. Broken spans one week in time, but it's an action-packed week, and with the revelations throughout the story, it's the most life-changing week Scarlet has ever had. I'm not usually a fan of books that take place over very short time periods, but the short time span really worked for Broken. Plus, there was an epilogue----love those----so there was plenty of closure and an added layer of depth to the story. 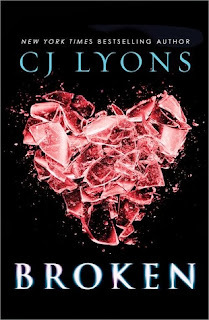 It's hard to write this review without giving away the huge surprise at the end of Broken. Suffice it to say, I was shocked beyond belief. Lyons' pacing was perfect, and had me on the edge of my seat for much of the story. The characters were well-developed, interesting, and varied from the typical high school students. I loved that Scarlet's flashbacks served such an important role in the conflict resolution. It was easy for me to mentally brush them off, thinking, oh, that's just another dream...but at the end, when everything came together, the crazy dreams made perfect sense. I'm new to C.J. Lyons but I'm very impressed with her work. I'll definitely be reading her work again. I highly recommend Broken for fans of contemporary YA and fans of thrillers.